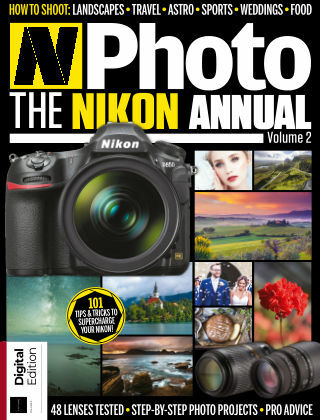 With Readly you can read N-Photo: The Nikon Annual and thousands of other magazines on your tablet and smartphone. Get access to all with just one subscription. New releases and back issues – all included. For this annual we’ve selected our best content from the past year of N-Photo – the only magazine dedicated to photography using Nikon DSLR cameras. We kick off our Essentials section with a choice selection of features, showing you how to photograph everything from winter landscapes to summer city breaks, while our excellent Apprentice articles pair a pro photographer with a reader and explain how to shoot everything from the night sky to a soccer match. A selection of projects guides you through essential techniques, from the basics of composition to how to best approach a classic car shoot. The Gear Zone is filled with group tests of everything from lenses (48 of them!) to accessories such as flash triggers and monopods, and will enable you to pick the right gear and help you to start shooting your best images yet.